In addition to maintaining the only statewide monument listing the names of every known fallen law enforcement officer in Kentucky's history, the Kentucky Law Enforcement Memorial Foundation provides relief in personal family tragedies and scholarship funds for the commonwealth's law enforcement officers and their families. 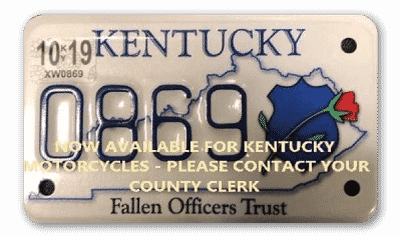 KLEMF Motorcycle License plates are available, contact your county clerk's office! Copyright © 2019 — Kentucky Law Enforcement Memorial Foundation • All rights reserved.